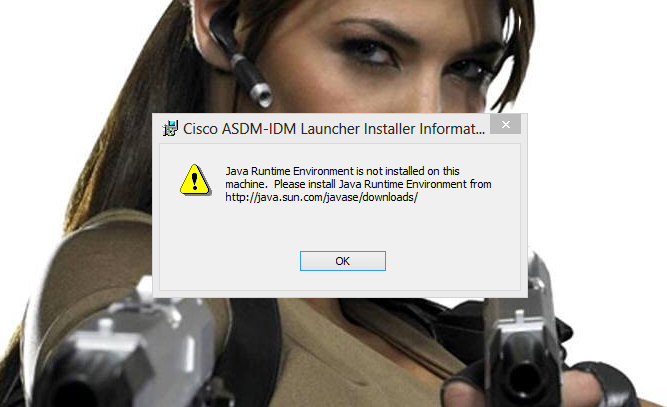 While moving to Windows 8, I had a problem installing the Cisco ASDM software. I was sure I HAD installed Java, I headed here to make sure. It turns out that the ASDM needs the 32 bit version of Java AS WELL. Download and install that, and he ASDM will install without error. Had this problem again this morning, I tried to install Java 32 and it complained that I already had it installed! I had to remove the 64 bit version, Install the 32 bit version and reboot before I attempted to install the ASDM. (I also connected to a 7.1(1) version of the ASDM to download the installer (I’m not sure that is relevant).